Once again, my cousin Marvin and I loaded our camera gear in my Chevy Blazer this time heading for Summer Lake near Paisley Oregon. Our plan was to meet our friends Ellen and Jef (yes, with one “f”) and arrive in time to share the Summer Solstice with them in the afternoon and observe the Strawberry Moon rise over Winter Rim in the evening. We had a cabin waiting for us at the Hot Springs and seeing our friends’ car, stopped at their cabin to say hello. After hugs and handshakes all around, we topped off the joyous reunion with a beer and a toast to the Solstice and friendship. “We found ourselves on the verge of a vertical and rocky wall of the mountain. 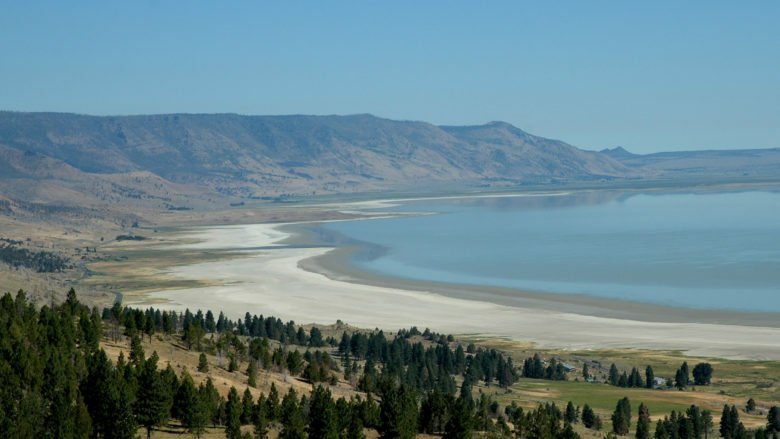 At our feet – more than a thousand feet below – we looked into a green prairie country, in which a beautiful lake, some twenty miles in length, was spread along the foot of the mountains, its shores bordered with green grass. Just then the sun broke out among the clouds and illuminated the country below, while around us the storm raged fiercely. Not a particle of ice was to be seen on the lake, or snow on its borders, and all was like summer or spring… We made the woods ring with joyful shouts to those behind: and as each came up, he stopped to enjoy the unexpected scene. Shivering on snow three feet deep, and stiffening in a cold north wind, we exclaimed at once that the names of Summer Lake and Winter Ridge should be applied to these two proximate places of such sudden and violent contrast.” Three days later they camped very near the current site of Paisley, but he doesn’t mention the presence of hot springs. Ellen invited us to join them for dinner. We remembered the Strawberry Moon and watched it rise over Winter Rim. The night sky was so clear we could see the Milky Way and to quote astrophysicist Carl Sagan, “billions and billions of stars.” Jef brought out the French card deck and his cribbage board . . . we teamed up and played cribbage until exhaustion won. 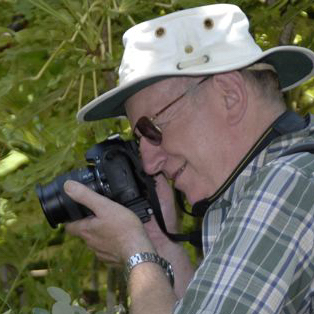 Summer Lake Wildlife Refuge, which is part of the Pacific Flyway, contains nearly 19,000 acres of wetlands and is popular with birdwatchers. 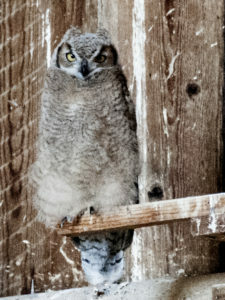 The next morning we ventured forth and found a family group of Great Horned Owls sheltering in an unused barn. At Ana Reservoir we were treated to the sight of an osprey carrying a fish so big it had trouble staying airborne. Hunger drove us back to our accommodations at the Hot Springs. We had time for a nap and went back to our friends to resume the cribbage marathon. We play a friendly style that allows for a lot of table talk . . . Jef and I finally admitted defeat. The force was not with us. Maybe next time.